We will shortly be taking pre-orders for two forthcoming titles: Face to Face: Polar Portraits by Martin Hartley and Huw Lewis-Jones in association with the Scott Polar Research Institute; and North-East Greenland 1908-60: The Trapper Era by Peter Mikkelsen. Both books are due to be released in November. 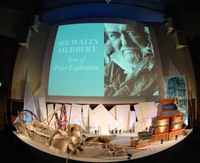 A memorial evening to celebrate the life of Sir Wally Herbert, pionnering polar explorer, will be held at the Royal Geographical Society in London in April 2009 to coincide with the anniversary of the British Trans-Arctic Expedition. Two of our forthcoming books featuring stunning new works by artists John Kelly and Emma Stibbon will also be launched later this year. The hardback edition of The Polar World is now on sale in all good bookshops. To view press release please click here. For as long as I can remember, every year on the 6th April the same few happy words have rung out – “Happy North Pole Day Dad!” – and every year the response has been essentially the same: a hug with a twinkle in my father’s eyes if I was with him, or a twinkle in his voice if I was calling from elsewhere. For us it was an anniversary as significant, if not more so, than a birthday, because it marked a day when my father had achieved something so remarkable that it went beyond the realms of family pride and, however much its significance may have been overlooked since, is indelibly imprinted in history. On 6 April 1969, after thirteen gruelling months on the polar pack ice, including five months of pitch darkness, my father and his three companions: Allan Gill, Dr Fitzroy (Fritz) Koerner and Dr Ken Hedges arguably became the first men to reach the Geographic North Pole on foot along the Arctic Ocean’s longest axis during their epic, sustained, 16-month-longjourney across the Arctic Ocean via both the Geographic North Pole, and the wonderfully-named Pole of Relative Inaccessibility – the point on the Arctic Ocean farthest from land in any direction. The men were exhausted by the time they reached the Pole. They had had to contend with the unrelenting force of the winds and currents of the High North, which fractured and buckled the ice around them, causing the skin of constantly shifting ice to rise up into elephantine pressure ridges or split into vast open leads around which no passing place could be found. They then had to convert the sledges into makeshift rafts and ferry equipment, men and dogs across, frequently to encounter another crippling adversary: mush ice, which bore the weight of neither man nor dog. In order to make use of the good winter ice they were travelling for ten or more hours a day in temperatures below -45°C. The elation and relief of reaching the North Pole – the goal of many other heroic explorers throughout history – was tempered for the small party: Fritz and Ken were suffering from hypothermia, Allan was recovering from a slipped disc, and they knew that they still had another two or three months of travel across rapidly deteriorating ice before their journey would be completed. Finally at 10.50 p.m. on 23 May 1969 my father climbed atop a pressure ridge and, looking through the telescopic sight of his rifle, he saw to his relief and amazement, land. He scrambled back to his sledge and quickly made a note of the time, and with his heart pounding shot off to tell his companions. Six days later, after facing the excruciating disappointment of finding open water, mush ice and gyrating ice pans three-quarters of a mile wide between them and the land they craved to set foot on, the men completed their journey across the longest axis of the Arctic Ocean with a wild scramble to a small rocky island known as ‘Vesle Tavleøya’ – the most northerly island in Svalbard, on which the mountain was given the name ‘Herbertfjellet’ by the Norsk Polarinstitute in 1979. Dad had taken his first steps towards the Polar Regions at the tender age of twelve when, for a bet of five shillings, he walked across the River Severn on ice that was barely thick enough to support his meagre weight. It was the first great triumph of his life that he could remember, and one of the most painful: the diminutive hero of this river crossing was given a beating when he returned home for having ventured out on the dangerous ice. It made him only more fascinated with the thrill of adventure. Dad spent a total of five years in the Antarctic travelling with dog teams and mapping forty-six thousand square miles of new country, and giving over one thousand place names to the then almost entirely un-charted continent of ice. Two geographical features were named after him: the plateau along the spine of the Antarctic Peninsula upon which he was the first to set foot, and the Mountain Range which forms the western wall of the Axel Heiberg Glacier - the route taken by Amundsen to the South Pole. His passion for exploration had started in earnest. In between his two expeditions to the Antarctic he hitch-hiked solo from Montevideo in Uruguay back to Britain, and made his first forays into the Arctic – the first a solo expedition around the coast of Spitsbergen and the second to the west coast of Greenland to buy dogs, which he transported back to the Antarctic, and then drove for three thousand miles. There is no doubt that the journey was a remarkable moment in the history of exploration, but the public’s enthusiasm was channelled elsewhere. The world was captivated by the progress of spacecraft Apollo 11 and its mission to the moon. But strangely the two very different goals were poignantly linked: at the very moment that Dad spotted land for the first time in fifteen months, astronaut Jack Young took the legendary photograph ‘Earth Rise’ – it was the first time that humankind had seen their planet from space. The success of the British Trans-Arctic Expedition fell into the shadow of the moon. While training for the BTAE, Dad had spent a great deal of time with the polar hunters of the Thule District in Northwest Greenland, and had experienced the fast-running current of modernisation that was threatening to undermine the ancient traditions of these wilderness people. On his return to the UK, and with the life changes that came with having a new family shortly after, it seemed the ideal opportunity to put endeavour aside for a while and instead take my mother Marie and me to live for over two years with the Polar Inuit for whom he had a deep respect. Some of the most moving stories I associate with Dad are those that involve the Polar Inuit; some told to me by him, others related by our Inuit friends; and all of them illustrate how he left his mark on their hearts. On my return to Thule four years ago I was regaled with stories from both old and young hunters and their families: my Inuit ‘brothers’ volunteered stories of how he had taken them with him on long journeys beyond their experience of their own familiar territory; how he knew their own ancient stories and history as well as they did; how he had been present when they had returned the bones of their first hunt to the spirit of the sea, and how he thought the same way as them – proved by the fact that when his sledge bumped over rough ice waking him from sleep on a long sledge journey his expletives were in the local dialect of Inuktun. Some of the old timers recounted how he understood their beliefs without mocking them; that he travelled as an Inuk hunter would and that the love of ice ran through his veins. All of them had light in their eyes as they spoke of ‘Ooowaaalleeeee’. His books, his photographs and paintings of both the Arctic and the Antarctic were his way of expressing his fundamental connection with these wilderness areas and the people of Thule, and it is this connection along with his unique character (rather than his achievements per se), that have coloured all the anecdotes and memories that my mother and I have heard from friends, acquaintances and peers since his passing. Many of the Friends of SPRI will have met my father and, I suspect, will have recollections of him as being a quiet, understated man who would rather stand in the shadows and listen to other peoples tales rather than venture his own. And yet when the mood took him he was the consummate teller of stories; a man who could, in his soft and even voice, cast a spell upon his listeners until they were utterly entranced, astonished and above all, wonderfully entertained. Anyone that knew him knows a ‘Wally story’; and every story reflects a rare humour and bold irreverence. A year and a half ago my father, mother and I sat on the lawn behind the tiny crofter’s cottage in the Highlands that had been their home for over ten years. In the golden haze of midges and sunshine we talked about his large collection of paintings and his travels and decided that finally it was time to put them all together as a retrospective on an extraordinary career, and also to present his very unique and intensely personal view of the polar world. Over many cups of tea we agonised over how best to present them to a publisher who would, surely, think it a wonderful project and publish this book that my mother and I in particular, felt was a vitally important piece of work. The following day, after having a rather depressing conversation with my agent about the state of the publishing industry, I turned to Dad and said, ‘I think we are going to have to publish this book ourselves.’ I borrowed a camcorder, sat my father once again in the garden and filmed him as he told the story behind each painting then spent hours transcribing the tapes. It was the start of a project that would consume us both right up until the first beautiful book came off the press, just days before he died. 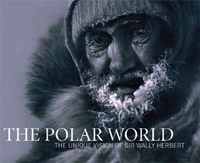 This book, entitled The Polar World, is a snapshot of a time when the Arctic Ocean could be crossed by dog sledge; when Polar Eskimos still believed that if the hunting was bad a shaman would have to talk with Sedna, a grotesque mythical creature who lived beneath the sea, to release the animals from her seaweedy hair; and when the pipe and cigar smoke of the parties of Scott and Shackleton still lingered in the Antarctic huts. It is as fitting as any tribute could be to a man whose love of the Polar Regions transcended any heroic aims he might have had as a young man, and his quiet passion for this wilderness environment shines out of every one of his meticulous paintings, which will be shown as an exhibition of prints at SPRI this winter. Throughout my father’s life synchronicity has played a vital role in renewing my father’s fascination with polar history. The date he reached the North Pole was the anniversary of Robert Peary’s disputed claim to have reached that same spot exactly sixty years before, and there are countless other examples of how my father crossed time-lines with the polar heroes that went before him. It therefore seems only natural that the private view of this exhibition should take place at SPRI on his birthday, 24th October, surrounded by the ‘North Pole Sledge’, his ration boxes and travelling furs that for many years have been part of the SPRI Museum Collection. It is a difficult thing to write a tribute to one’s own father without being overly sentimental. However, one moment comes to mind that at least sums up my relationship with him: Just a couple of days after Dad’s death I was asked by the BBC to say a few words on an obituary radio programme about him. The interviewer asked me if I thought my Dad was a hero. I answered very quietly: ‘I think everybody thinks their Dad is a hero. Yes he was my hero, but more than that, he was just my Dad. The spectacular Gala Testimonial held in honour of Sir Wally Herbert at the Royal Geographical Society in London in October 2006 was a great success. Hosted by comedienne Sandi Toksvig, a glittering array of stars in the world of exploration, and showbiz turned out to honour Sir Wally just a few days before his 74th birthday. Contributors to the Gala, such as Pauline Collins, John Alderton, Jonathon Porritt, Sir Chris Bonington and Robin Hanbury-Tenison, gave an intimate glimpse into the life’s work of this modest doyenne of polar exploration. On the 11th May, Polarworld and sponsor Hurtigruten joined forces to celebrate the launch of Hurtigruten’s new state-of-the-art cruise ship MS Fram. The new Fram, named after Norwegian explorer Nansen’s own ship in which he attempted to sail across the Arctic Ocean via the North Pole, is a state-of-the-art new cruising vessel that will sail to both the Arctic and the Antarctic, as its historic namesake did during the heroic age of polar exploration. Hurtigruten and Polarworld have embarked on a new and exciting relationship – Hurtigruten were co-sponsors of the Gala Testimonial [read article about this] – and since then they have supported the publication of Sir Wally’s The Polar World and aim to work with Kari Herbert on an exciting voyage to the far Northwest of Greenland to the place where Kari spent the first two years of her life among the Polar Inuit.